This dessert hits all the buttons: Chocolatey, Creamy, Slightly Sweet, Crunchy, and totally Luscious. Serve this in a Trifle Bowl and you will be hearing oohs and aahs all around. The Trifle Bowl will give you a beautiful presentation. However, using small clear glasses is perfect when you only need a couple of parfaits. 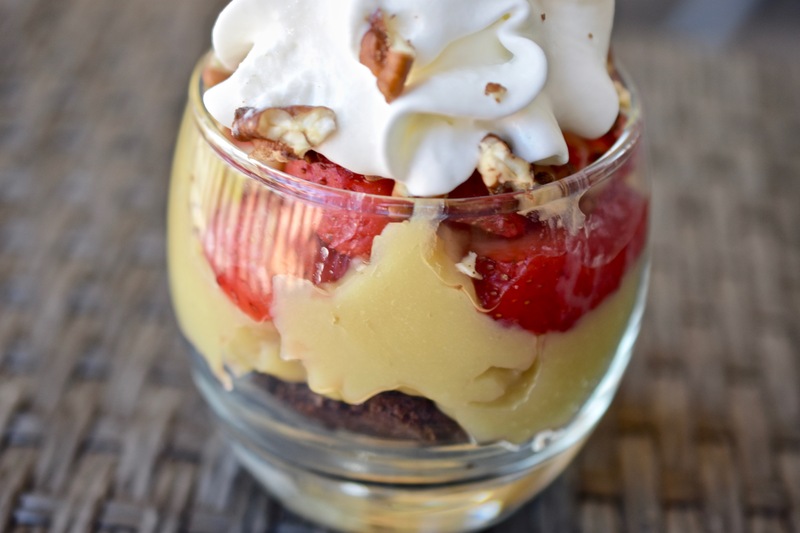 Layer parfait accordingly: Outrageous Brownie, Sweet Potato Cream, Strawberries, Whipped Plant Cream and Top with Vanilla-Pumpkin Spice Pecans. Repeat layers again if you choose. Where’s my spoon? This looks truly scrumptious. Scrumptious is the perfect word. This is a healthy indulgence.